Vascular lesions, Angioma, hemangioma, kaposi sarcoma, angiokeratoma, Pyogenic granuloma, Lymphangioma circumscriptum, Targetoid hemosiderotic hemangioma, Port wine, Angiosarcoma, Dermoscopy, Dermatoscopy Vascular lesions – cite! Vascular lesions (message) Vascular lesions – participate! Cutaneous vascular lesionsThis glossary term has not yet been described. comprise of all skin disease that originate from or affect blood or lymphatic vesselsThis glossary term has not yet been described., including malignant or benignis any condition that is harmless in the long run tumors, malformations and inflammatoryThis glossary term has not yet been described. disease. While some vascular lesions are easily diagnosed clinically and dermoscopically, other vascular lesions can be challenging as many of them share similar dermoscopic features. This chapter reviews all vascular lesions for which dermoscopic features were previously described. AngiomaAngiomas are benign tumors derived from cells of the vascular or lymphatic vessel walls (endothelium) or derived from cells of the tissues surrounding these vessels. Angiomas are a frequent occurrence as patients age, but they might be an indicator of systemic problems such as liver disease. They are not commonly associated with malignancy.This glossary term has not yet been described./HemangiomaThis glossary term has not yet been described. The most common vascular lesions in childhood are the hemangiomas of infancy and, in adulthood, the cherry angiomas. Hemangiomas and angiomas are benign proliferations of blood vesselsare the part of the circulatory system, and microcirculation, that transports blood throughout the human bodyThis glossary term has not yet been described. and although they have different clinical behavior, they are described together because they share common dermoscopic features. LacunaeThis glossary term has not yet been described. (also known as lagoons): well-demarcated, round to oval red, reddish-brown or reddish-blue areas that commonly vary in size and color within a given lesion. Lacunae may be either tightly clustered or loosely scattered throughout the lesion and they are often located on a background of red, red-blue, or red-white homogeneous colorColor (American English) or colour (Commonwealth English) is the characteristic of human visual perception described through color categories, with names such as red, yellow, purple, or blue.. No vascular structuresThis glossary term has not yet been described. are seen inside the lacunaeThis glossary term has not yet been described.. Occasionally, individual dilated blood vessels or a red networkThis glossary term has not yet been described. of vessels may be visible. Hemangiomas may develop a partial thrombosis, acquiring a focal blue-black color, or a total thrombosis manifesting a jet-black color. 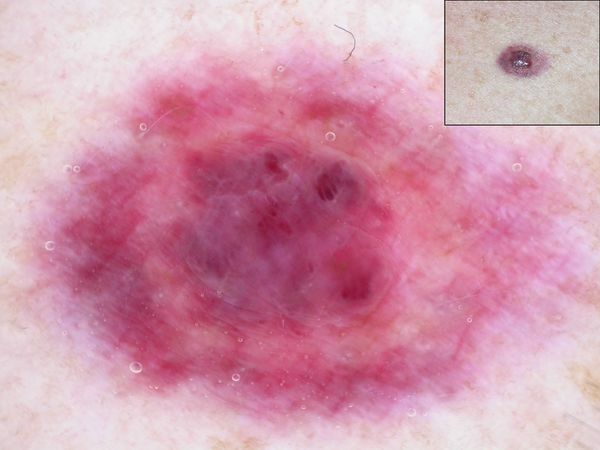 Angiokeratomas are acquired vascular lesions that present as shiny, soft, dark red to violaceous, 2–10 mm papules which may develop a blue-violaceous to black color and a surface scale. Four clinical subtypes of angiokeratomas have been described: solitary angiokeratomais a benign cutaneous lesion of capillaries, resulting in small marks of red to blue color and characterized by hyperkeratosisThis glossary term has not yet been described. (the most common type), angiokeratoma of Mibelli, angiokeratoma of Fordyce, and angiokeratoma corporis diffusum. Dark lacunae: sharply demarcated, ovoid structuresThis glossary term has not yet been described. with a dark blue, dark violaceous or black color. Blue-White veil: confluent blue pigmentation with an overlying whitish haze. Ulceration and surface scale may be present. Rarely, rainbow patternCircumscribed structureless areas displaying colors of the whole spectrum of visible light may be present. Common, benign, acquired, vascular lesionThis glossary term has not yet been described. of the skin and mucosa. Typically presents in children or young adults as a solitary, rapidly growing, red papule or nodule that tends to ulceration and bleeding. They are related to infective organisms, penetrating injury, hormonal factors (pregnancyThis glossary term has not yet been described. ), retinoid therapy, or other systemic medications (i.e., docetaxel). Reddish or red-whitish homogeneous area: a structureless zone whose color varies from completely red to red with whitish zones. White collarette: a ring-shaped or arcuate squamous structure that is usually located at the periphery of the lesions. White rail linesstreaksThis glossary term has not yet been described. : white streakslines radial (always at periphery) streaks Reed nevus melanoma recurrent nevus that intersect the lesion. Vascular structuresThis glossary term has not yet been described. (dotted vesselstiny pinpoint vessels, hairpin vessels, linear-irregular vessels, telangiectasias, polymorphous vesselsmultiple types of vessels are present may indicate malignancy in appropriate context for example in flat melanocytic lesions). The most frequent dermoscopic pattern of pyogenic granulomaThis glossary term has not yet been described. consists of reddish homogenous areas separated by white lines resembling rails and surrounded by a white collarette. Acquired, slowly growing, asymptomatic, benign vascular tumor that usually presents on the upper limbs, forearms, or trunk of young to middle-aged adults. It appears as sharply circumscribed, bright red, solitary lesions varying in size from 0.5 to 2 cm. Diffuse erythema with multiple well-demarcated small red globules of different sizes. Peripheral fine pigment networkGrid-like pattern consisting of interconnecting pigmented lines surrounding hypopigmented holes. Benignis any condition that is harmless in the long run vascular disorder, characterized clinically by multiple minute, red-to-purple, grouped macules distributed in a serpiginous or gyrate pattern. Capillary malformation that is present at birth and persists throughout life. It may be localized or cover extensive areas of the skin surface. Malformation involving primarily lymphatic vessels. Clinically, it appears as numerous small vesicle-like lesions grouped in a plaque. Sometimes, intermediate skinThis glossary term has not yet been described.-coloured, yellow or white circular homogeneous area. Occasionally, a reddish-violaceous or ecchymotic homogeneous area occupies the whole lesion. A peripheral delicate pigment network, white structures (shiny white lines) may be present. Vascular proliferation caused by human herpesvirus-8 (HHV-8). It is considered a low-grade malignant vascular tumor. There are four recognized clinical subsets of Kaposi’s sarcoma: classic, endemic, iatrogenic, and HIV related. Clinically the cutaneous lesions begin as reddish-blue macules or plaques that gradually enlarge and become nodularThis glossary term has not yet been described..
Homogeneous patternA pattern lacking any definable pigment structures, structureless pattern with differing colorsThis glossary term has not yet been described. (i.e., whitish, pinkish, reddish, bluish, or violaceous) in different lesions in the same patient. Rainbow-like appearance: multicolored areas showing various colors of the rainbow spectrum. This sign is not pathognomonic of Kaposi’s sarcoma and it is only seen with polarized lightThis glossary term has not yet been described. 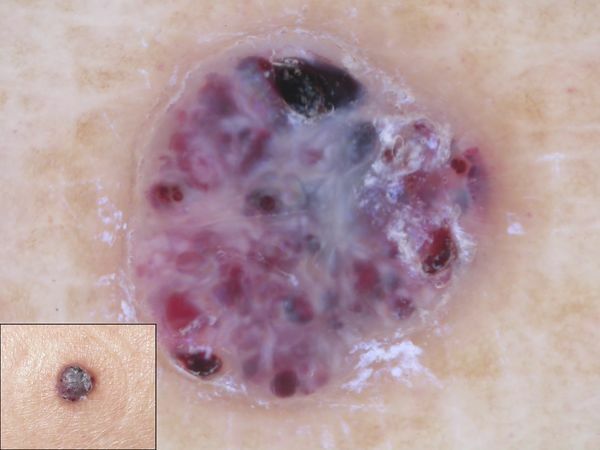 dermoscopyThe examination of [skin lesions] with a 'dermatoscope'. This traditionally consists of a magnifier (typically x10), a non-polarised light source, a transparent plate and a liquid medium between the instrument and the skin, and allows inspection of skin lesions unobstructed by skin surface reflections. Modern dermatoscopes dispense with the use of liquid medium and instead use polarised light to cancel out skin surface reflections..
Whitish structureless areas, vascular structures, scale, and a white collarette may also be seen. Aggressive neoplasm which is mainly divided into three variants: angiosarcomais a cancer of the inner lining of blood vessels, and it can occur in any area of the body. The disease most commonly occurs in the skin, breast, liver, spleen, and deep tissue. of the head and scalpThis glossary term has not yet been described., lymphoedema-associated angiosarcoma and radiation-induced angiosarcoma. It is characterized by a tendency to metastasize to regional lymph nodes and lungs. Prognosis is poor. Clinically, early lesions develop as ill-defined violaceous to bluish areas with an indurated border and advanced lesions become elevated or nodular and occasionally ulcerated. White lines at the nodular parts. ↑ 1.0 1.1 Piccolo et al. : Dermatoscopy of Vascular Lesions. Dermatol Clin 2018;36:389-395. PMID: 30201148. DOI. ↑ Piccolo et al. : Dermatoscopy of Vascular Lesions. Dermatol Clin 2018;36:389-395. PMID: 30201148. DOI. ↑ Zaballos et al. : Dermoscopy of solitary angiokeratomas: a morphological study. Arch Dermatol 2007;143:318-25. PMID: 17372096. DOI. ↑ Zaballos et al. : Dermoscopy of pyogenic granuloma: a morphological study. Br. J. Dermatol. 2010;163:1229-37. PMID: 20846306. DOI. ↑ Scalvenzi et al. : Dermoscopy of microvenular hemangioma: report of a case. Dermatology (Basel) 2007;215:69-71. PMID: 17587844. DOI. ↑ Ohnishi et al. : Angioma serpiginosum: a report of 2 cases identified using epiluminescence microscopy. Arch Dermatol 1999;135:1366-8. PMID: 10566835. ↑ Gencoglan et al. 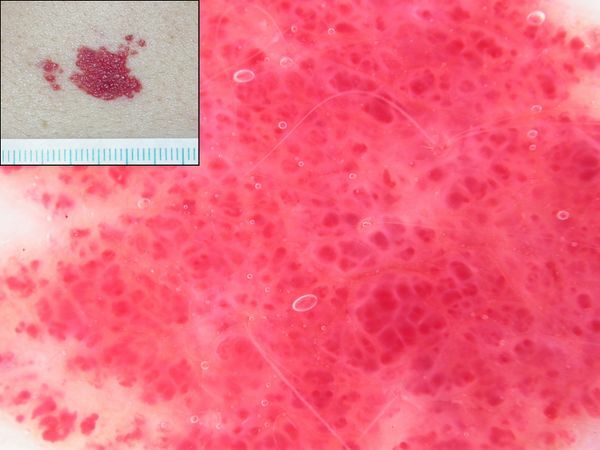 : Hypopyon-like features: new dermoscopic criteria in the differential diagnosis of cutaneous lymphangioma circumscriptum and haemangiomas?. J Eur Acad Dermatol Venereol 2012;26:1023-5. PMID: 21645121. DOI. ↑ Zaballos et al. 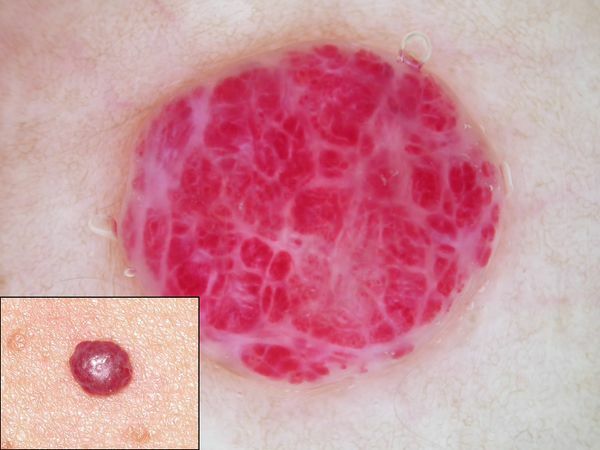 : Dermoscopy of Targetoid Hemosiderotic Hemangioma: A Morphological Study of 35 Cases. Dermatology (Basel) 2015;231:339-44. PMID: 26458032. DOI. ↑ Cheng et al. : Rainbow pattern in Kaposi's sarcoma under polarized dermoscopy: a dermoscopic pathological study. Br. J. Dermatol. 2009;160:801-9. PMID: 19067686. DOI. ↑ Vázquez-López et al. : Dermoscopic rainbow pattern in non-Kaposi sarcoma lesions. Br. J. Dermatol. 2009;161:474-5. PMID: 19438855. DOI. ↑ Zalaudek et al. : Clinical, dermoscopic and histopathological features of spontaneous scalp or face and radiotherapy-induced angiosarcoma. Australas. J. Dermatol. 2013;54:201-7. PMID: 22943153. DOI. This page was last modified on 28 December 2018, at 18:10.